By an iconic brand mouse. Dads should be treated the same. But they’re not all around. Dads are left out of the talk. It’s all quite a shock. You have plenty to dread. We’re talking bottles, not breastfeeding. Dad can’t handle an oven? Dad will manage the fever. If Dr. Cocoa dismissed her. But there’s still work to do. One parent is in charge. Dads are parents – supercharged! And you’ll have a good night. The new era begins after 40 years of proclaiming – through a familiar television commercial jingle – that “Kids love Kix for what Kix has got. Moms love Kix for what Kix has not.” In more recent years, dads regularly took to social media to voice displeasure, but those pleadings went largely unrecognized. Siemienas said the updated slogan and new box “worked out well” so that both happened at the same time. General Mills has yet to phase out the slogan entirely. Its Kix page at generalmills.com still trumpets the previous wording, and kixcereal.com not only contains the old slogan, but old box logos. Siemienas added that General Mills is working on updates to company websites. For now, dads are overwhelmingly pleased with the Kix change. The National At-Home Dad Network – a volunteer-run, nonprofit which provides support, education and advocacy for stay-at-home dads – lauded the change on their Twitter page. Kix boxes with the old slogan will likely still appear on store shelves, but any new boxes being produced have the new wording, according to Siemienas. The box revision comes on the heels of a similar switch in the United Kingdom by Kellogg’s after pressure from dads who complained of its exclusionary Coco Pops box. To see food products like Jif and Kix hold on to their timeworn, stereotypical catchphrases — all of it has reached a state of comicality. It certainly suggests absurdity and irrationality. We’re talking about peanut butter and cereal. Those products are specific to moms? But then there are those items related to babies, and less people seem to notice the exclusionary practices tied to its marketing. Boppies were never invented solely for mothers, but they’re regularly positioned to exclude dads from messaging and thus, demote dads to secondary parental status. Similac offers baby formula – a surefire product for dads if there ever was one – yet its makers go out of their way to reject dads in messaging. All of this is detrimental to families, of course, because it impedes the family from flourishing as it should without recognizing fathers as equal, competent parents. Dr. Brown’s can now be grouped with the Boppy and Similac. They’re all products that owe us a little more, that need to try a little harder, that have a responsibility to go out of their way to ensure that dads don’t feel left out. 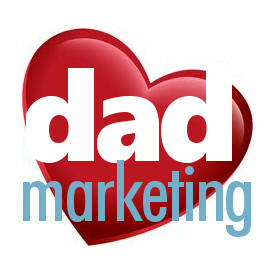 They’re products that should regularly feature dads and speak to them in all that they do. Go ahead and try to find a single image of a dad on the Dr. Brown’s site. Is there even one? That’s hardly representative of today’s modern families, or even families of yesteryear. The current actions of companies like Dr. Brown’s, Boppy and Similac would be a little like Lowe’s only using men in its ads and scripting slogans and ad copy that only speaks to that one gender. And imagine the uproar if they did! Rather, they know that home improvement is hardly a gender-specific thing, even though common stereotypes indicate that power tools and outdoor work is supposedly for men. But instead, Dr. Brown’s takes the old-fashioned route and tells us that dads don’t take care of babies, or can’t bottle feed, or don’t want to. It’s all very troubling for a company that prides itself on innovation and support. And check out the disconcerting use of moms as a synonym for parent. Sorry Dr. Brown’s, but not all parents are moms, and thus, those terms can’t be succinctly substituted without leaving someone out. Also take note of its Ambassadors program. Not only does it exclude fathers, it behaves as if they don’t exist. Dr. Brown’s Twitter bio promises that its focus is “to create innovative feeding products to promote good health and optimal nutrition for baby.” If that’s true, then it’s time to make several revisions to its website and social media. Dads want to deliver those things, too, and if someone tells him he can’t, he’s going to look elsewhere for someone who believes in him. Is Rice Krispies really intended for only kids and moms? Makers of breakfast foods have long been known for innovation. New cereal and frozen foods hit the shelves regularly. But it would seem that not everyone’s invited to the table. 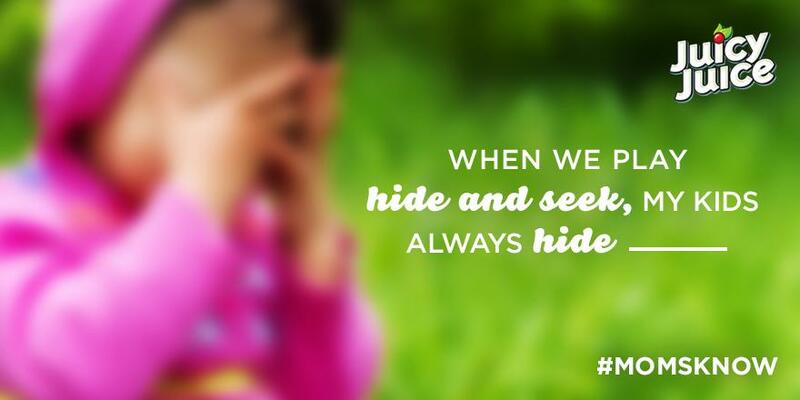 Pick up any cereal box and you’ll often discover a world that speaks only to moms. Despite all the newfound innovations in the grocery store, marketers remain convinced that the family dynamic hasn’t changed – that dads don’t take care of children, don’t tend to the home, or even spend their morning ritual with the family. The Rice Krispies Twitter page reinforces this outdated stereotype with a Twitter bio (right) that excludes dads from the outset. The exclusion is particularly surprising for a brand that’s well accepted and loved by families everywhere — families which include dads. Its approach is surprisingly consistent with a few of its iconic shelf mates. It wasn’t until 2015 that Cheerios changed its webpage touting itself as “Mom’s Choice.” Kix defers to mom in both slogan and message on every box. Even the back of Frosted Mini-Wheats exhorts kids to specifically ask mom for more. 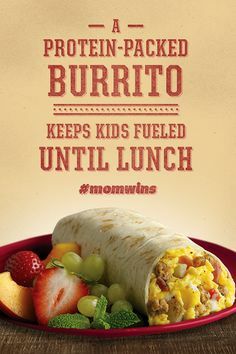 And El Monterey has long used the hashtag #momwins throughout its social media. Our tweets on the Rice Krispies bio recently caught the attention of Kellogg’s, but the communication fell flat when subsequent tweets weren’t returned. We’re still waiting for what could be a quick fix and thus restore balance to the cereal shelves. Of course, this particular cereal stretches far beyond the bowl. The oft-duplicated rice puffs are a virtual kitchen staple, useful in many recipes around the kitchen. Its Twitter page frequently touts its popular endearing spinoff, the Rice Krispies treat. Even its venerable mascots Snap, Crackle and Pop resonate with everyone. Given its prowess in our daily lives, let’s hope Rice Krispies can turn things around soon and become close with dads again. Can’t dad use a Boppy? Last month we came across a thought-provoking post titled “Needlessly gendered products for men.” There’s actually several articles on this topic, so consider reading at least one of them via your friendly neighborhood browser. Jif Peanut Butter – to its credit – is slowly releasing the stranglehold it has on its timeworn phrase, but it’s still hard to believe the CEOs of these companies continue to cling on to these old-fashioned, sexist slogans, allowing their marketers to intentionally discount the viability of at least half of its customer base, particularly with products that have nothing to do with gender. Alas, peanut butter is no more a feminine product than watching football is intended solely for men. But then you have some products which seem to bemuse our perception, products which have been marketed for so long, positioned in such a convincing way and aimed at a certain audience that we’ve come to believe its use was envisioned strictly for one gender. Its website is loaded with mom-only references, and yet you may be surprised to know the product was never intended for nursing. “Now it’s almost embarrassing to admit, but when people started using it for breast-feeding, I was like, ‘Oh, yeah. Of course,’” she said. A brief reflection upon its own history and founding – and a glance at its own latest ad – may encourage Boppy to return to its roots. Check out the bottom of this ad, where Boppy describes four of its product’s core uses, none of which have to do exclusively with moms (while physical breastfeeding does, general feeding – the word used in the ad – doesn’t). If a Boppy can do all these things, why exclude dads from its marketing and ignore dads’ contributions to parenting? Yet it specifically proclaims the Boppy to be mom’s domain. It’s another unfortunate exclusionary tale which makes us wonder at least four times over: why not use the word “parent” instead of “mom”? Replacing that word would no longer alienate dads, it wouldn’t make moms turn the page in revolt, and Boppy would position itself as a true baby product for both parents. It’s a little ironic that Boppy references “boy bands” is its clever headline. 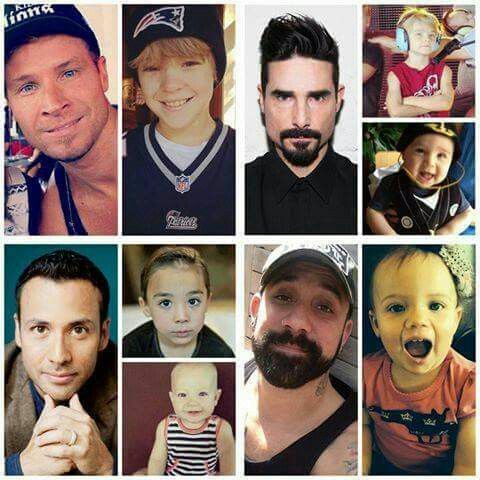 Several members of those ‘90s bands are now dads, and rumor has it that some of them even use a Boppy. What do you say Boppy? Twenty-six years is a long time, but it’s time to start recognizing both genders as equal parents. Statistics and ratings indicate that more men attend, watch and follow the NFL in greater numbers than women. Take a casual look at fantasy football leagues, and those numbers widen even more. So if it were the case, you could forgive the NFL for targeting males in its advertising. But being the wise, billion-dollar enterprise it is, you’ll hardly find its 32 teams (total worth: $63 billion) spending its marketing dollar only where the big money is located. Rather, it places a strong emphasis on women, and wouldn’t dare make the catastrophic mistake of alienating an important part of its fan base. The juxtaposition is unusual, because families include dads, and in general, kids love their dads. So if good2grow wants to create a product kids love, it should consider the other half of its customer base, which also includes boys, many of whom will eventually become dads. Right now, it’s not speaking to dads in print, or on its website. What do you say, good2grow? Can dads be a part of your team? What exactly does this Twitter bio say about dads? And if you are a dad, what is it saying to you? In our estimation, it’s saying that you don’t count, the company isn’t talking to you, and it doesn’t want your business. 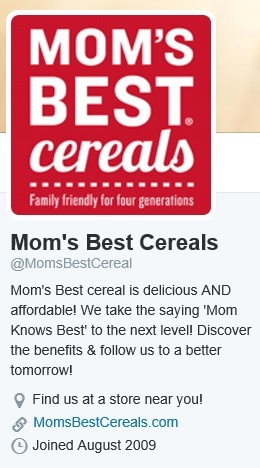 What’s strange about MOM Brands is that it adopted its exclusionary name in 2012. No, that’s not 1912, but 2012 – as in, three years ago! Jif adopted its discriminatory slogan decades ago, and same for Kix’s mom-centric box, while Similac has been ignoring fathers nearly since its beginning. But 2012? It’s hard to imagine a company looking so old-fashioned in today’s equality-hungry, politically correct world that strives to include everyone and even blur the lines between, say, toys and clothes. Alas, MOM Brands has found a way to make even cereal buying sexist, because dads apparently do not know best. But don’t families include dads, too? Apparently not, according to MOM Brands, or it might recognize them by name – or at least on Twitter. It’s hard to stomach this say-one-thing, do-another corp-speak, especially since MOM Brands seems like a rather progressive group. We admire its innovative packaging that’s helping to keep its cost (and customers’) down. Its variety and tastes are every bit good as the next cereal brand. But that name. And that Twitter bio. Both are enough to make dads reach for something else. Chances are, they already have, but it won’t be easy: marketers of the cereal industry seem insistent that only moms have the ability to put breakfast food on the table, and/or mom’s place is in the kitchen. Alas, cereal makers are stuck in time (see #7). It’s quite the reversal from the days when pa would gather and hunt for what the family needed. MOM Brands says it’s taking the saying “’mom knows best’ to the next level,” and perhaps that’s a good thing. Maybe, just maybe, that “next level” might include dads in the future.